The most commonly shaped gemstones used in an invisible setting are square and princess cut. This is a very difficult setting type to create and work on. This is because it requires a highly trained master jeweler, and usually requires a lot more labor than what is required on other types of jewelry settings. The invisible setting is not commonly used in jewelry design because it is an intricate and difficult setting type. Only the most experienced jewelers can properly set gemstones in this method. Additionally, the cost of labor and the time spent in making invisible set jewelry adds to the value of your item. This setting has many places for dirt to hide and gather, which can lessen the sparkle of gemstones. Therefore, this type of setting needs routine professional cleaning to maintain the fire, sparkle, and brilliance of the gemstones. Also, routine professional inspections are required to make sure that the gemstones remain secure. These extra maintenance requirements are good for you to consider before purchasing jewelry with an invisible setting. If you are someone who is into heavy duty activities on a regular basis, then unfortunately invisibly set jewelry might not be for you. Heavy activity or a direct hit on small gemstones can loosen their grip. This creates a high susceptibility of gemstones falling out. This setting is more expensive than other jewelry settings, and it requires special preparation of the gemstones. It also requires an experienced and skilled stone setter. Therefore this setting is more expensive than others due to the extra labor costs needed to create this beautiful design. We have your back! Here at MJR, we employ Master Jewelers that know how to properly work on this intricate and difficult setting. The best way to secure invisible set stones is to hand cut grooves into the girdle of the gemstones. This method is time consuming, and therefore it is more expensive. However, cutting the individual stones creates pressure between them, which keeps them secured within the metal framework so they are protected. We are proud of the service we offer as we know other jewelers without the capabilities have to resort to using a gluing method to keep the stones in place. However when stones are simply glued to each other, it creates a setting that is weaker; that is why gluing is a practice that we don’t subscribe to. 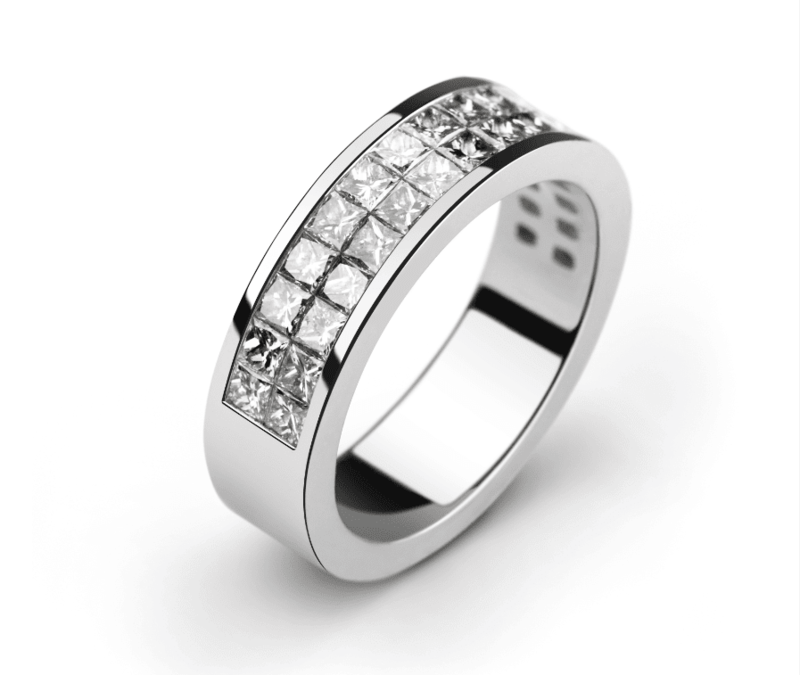 If you would like more information on our other ring repair services, feel free to click here.